The frame is not original, but appears to be of the same period as the painting, which is late Victorian. 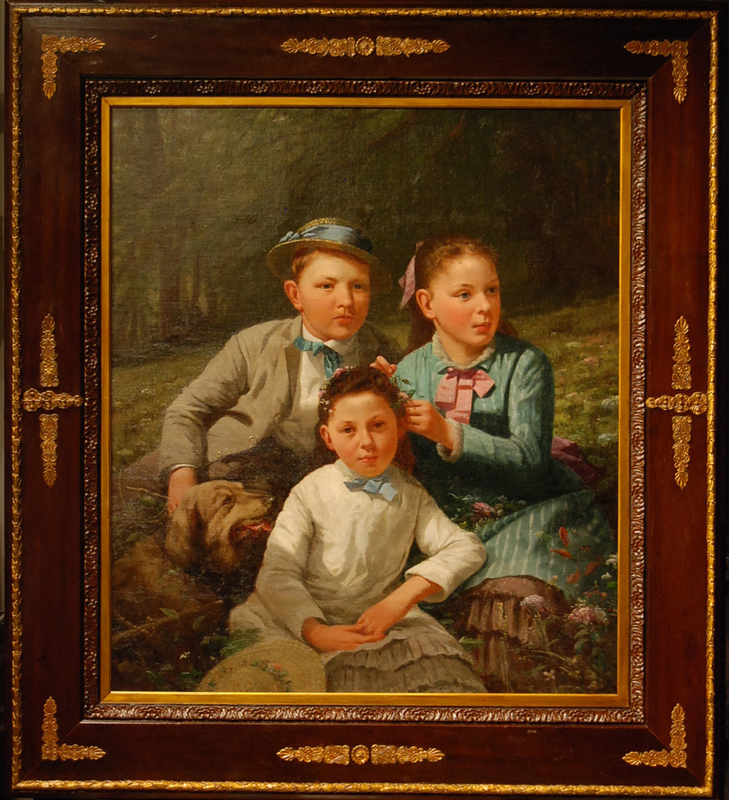 The children depicted in the painting were ancestors of the current owner. They were painted at their parent’s estate on Long Island, New York in the late 1880’s to early 1890’s. The painting was not signed by the artist, nor were there any inscriptions on the frame, canvas or stretcher. Because of the affluence of the family, it was presumed that the artist who painted this portrait would have been fairly prominent. The origin of the frame or when it was added to this painting is unknown. It has been passed down through the years and still belongs to the family. 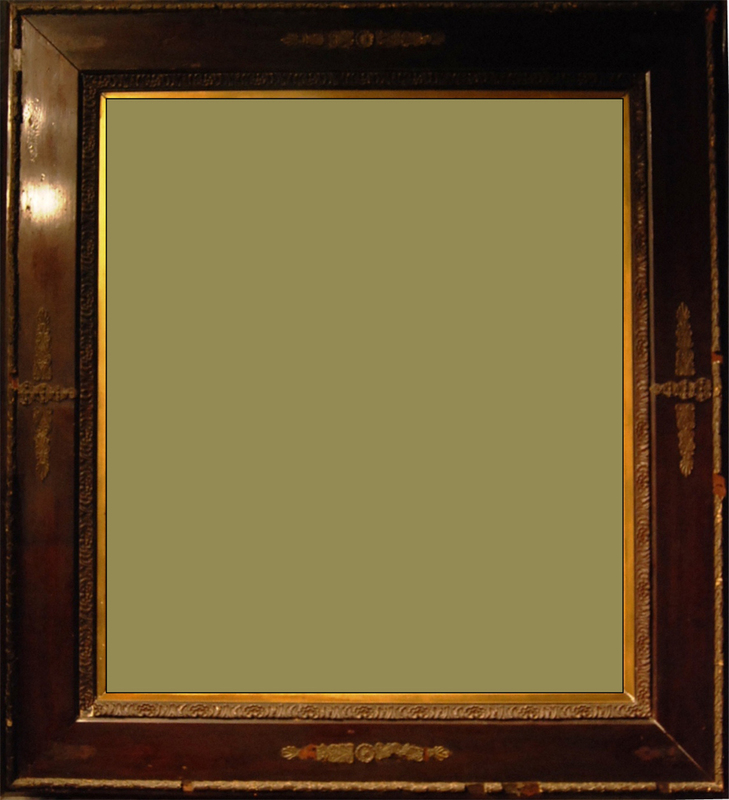 The frame was made of a 1 ¼” thick plank of mahogany with ornaments made of gilder’s composition. The ornamentation was either painted to look like mahogany or gilded with gold leaf. There were pine glue blocks attached to the reverse side of the frame to enhance its’ structural integrity. The frame had been cut down and resized to fit this painting. There was evidence that some of the cast gilded ornaments located in the middle of each side were original, whereas others were not. 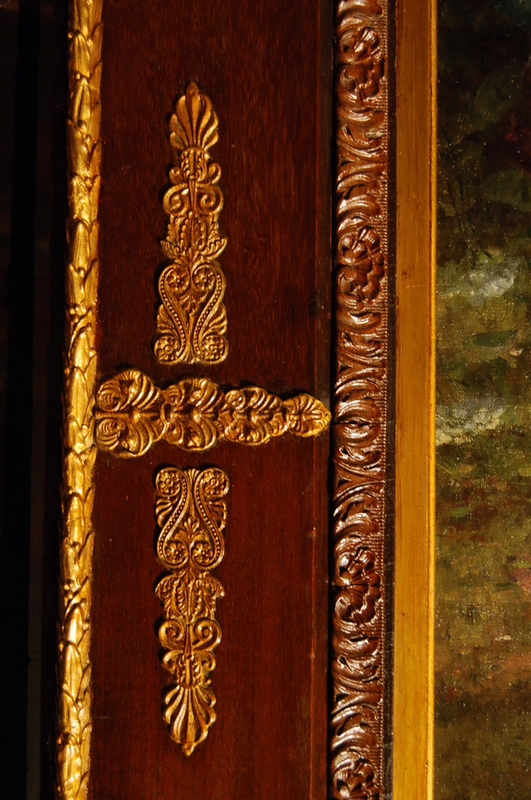 There were similar ornaments on one side of each corner, but they weren’t present when the frame was initially examined. The gilded laurel leaf and berry decorative roping along the outside edges of the frame was original to the frame, but many of the individual leaf sections were not in their proper order. There were 15 different leaf orientations that made up a repeating pattern. About 1/3rd of the leaf segments were glued back onto the frame out of order. This might have occurred when the frame was resized to fit this painting. The frame’s outer ornaments have been overpainted sloppily with metallic paint, now tarnished. The vertical side members were made up of two separate pieces of mahogany frame stock that were end-joined in the middle of each side. The joints were concealed by covering them with lead leaf ornaments. Both mitered ends of the bottom and top pieces of the frame show the outline of the same leaf ornament used in the middle of each side. The mitered ends of both sides of the frame however, were missing this outline. All four miter joints gapped somewhat and were not properly aligned, which was an indication that this frame had been modified. 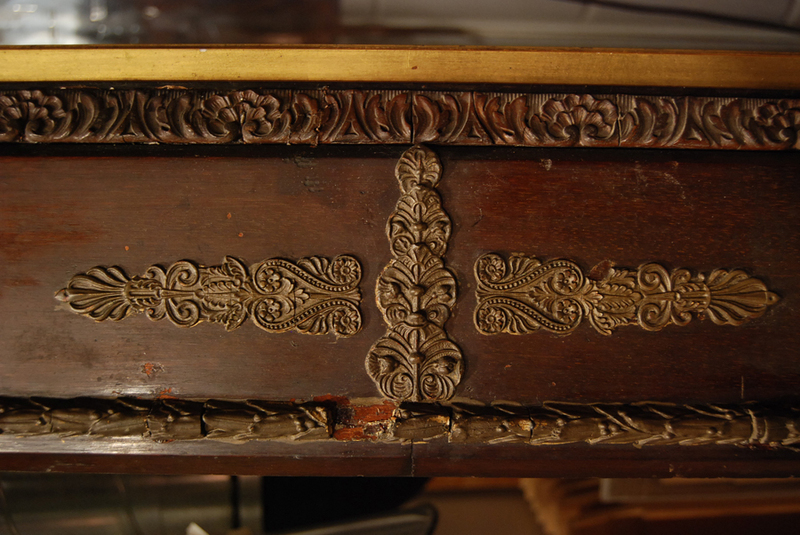 The inner band of ornaments, painted to look like mahogany, was a complete molding (not joined in the middle). The frame’s finish had darkened considerably with age, and there were now many dents, gouges, scratches, and abrasions on the surface. The artifact was documented with a written report and digital photography, before, during and after treatment. The painting held by the frame was removed and conserved. The poorly joined frame corners were separated, and new straight 45 degree miters were cut. The two frame liners were temporarily removed to facilitate treatment on the main mahogany frame pieces. 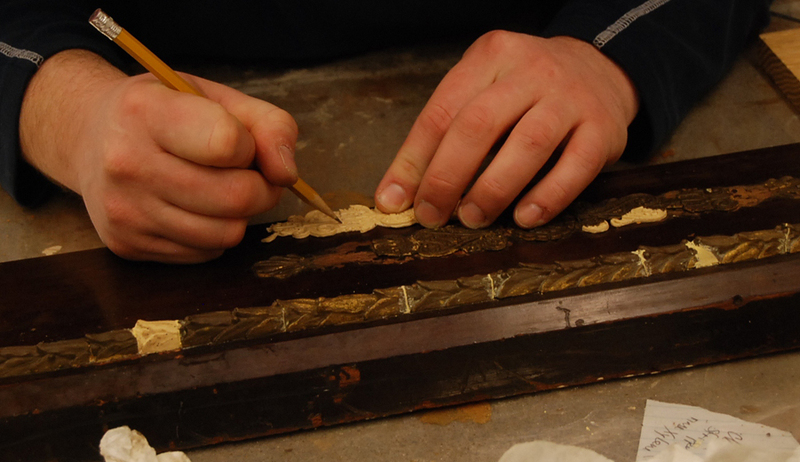 The overpaint on the outer gold laurel leaf roping was removed with organic solvents followed by a dilute detergent. The inner two frame liners were cleaned with the same materials. The coating on the surface of the mahogany was thinned with alcohol to remove at least half of this very darkened, desiccated, and dirt embedded shellac layer. Many of the scratches and gouges in the mahogany only penetrated through part of the thick varnish coating. Using ethanol and very fine sand paper, the edges of losses were tapered to facilitate smooth rebuilding of the varnish finish. When we started to consolidate the loose and detached pieces of the outer laurel leaf band we quickly realized that some on the pieces we had wouldn’t fit anywhere and the many of the pieces that had been reattached in the past were in the wrong positions. We determined that there were two intact sections of this molding that when combined formed an entire repeating pattern of 15 segments. 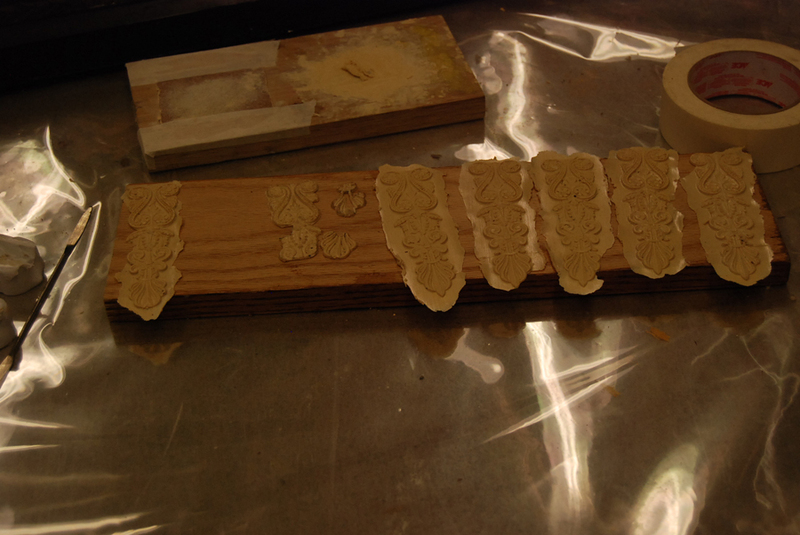 We made a drawing of the original repeating pattern and used it to reorder the rest of the molding. Molding from about 20 areas that had been restored totaling about 60” needed to be removed and reordered. 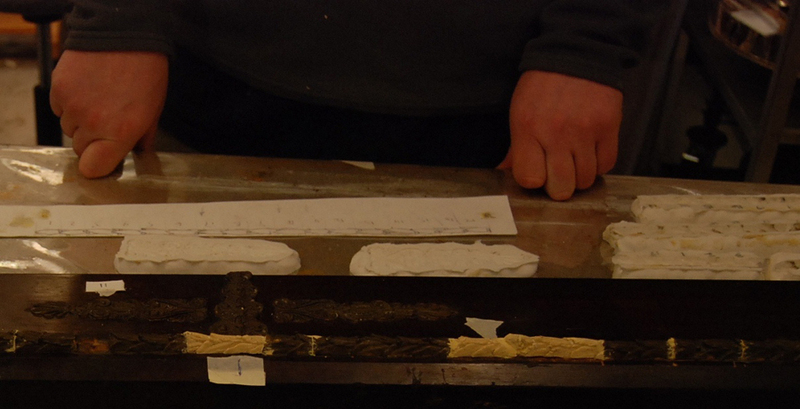 About 40, ½” to 6” pieces were reattached with hot hide glue. Silicon molds were made of the intact two sections of molding and then about 10 castings were made of each mold using gilder’s composition as were molds and castings of all other missing pieces. 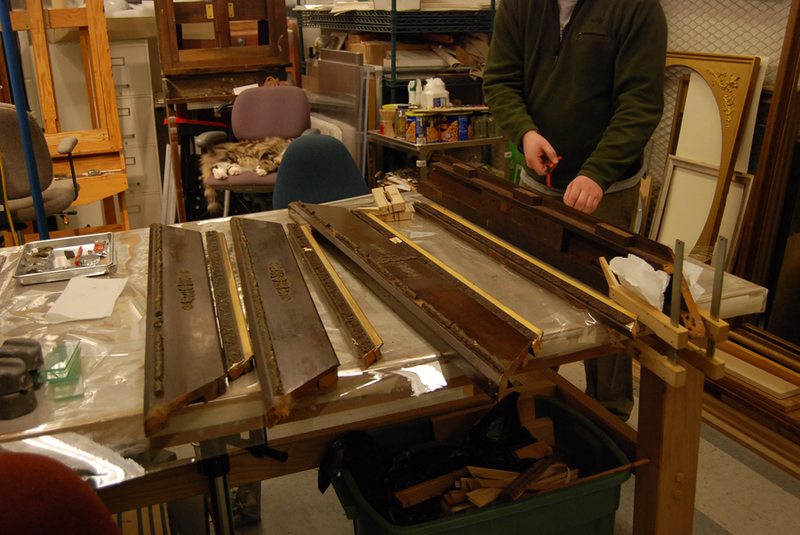 These were cut up to furnish the missing molding pieces and attached to the frame in the same method. Small losses in this molding were filled with gesso. The frame was now completely reassembled. 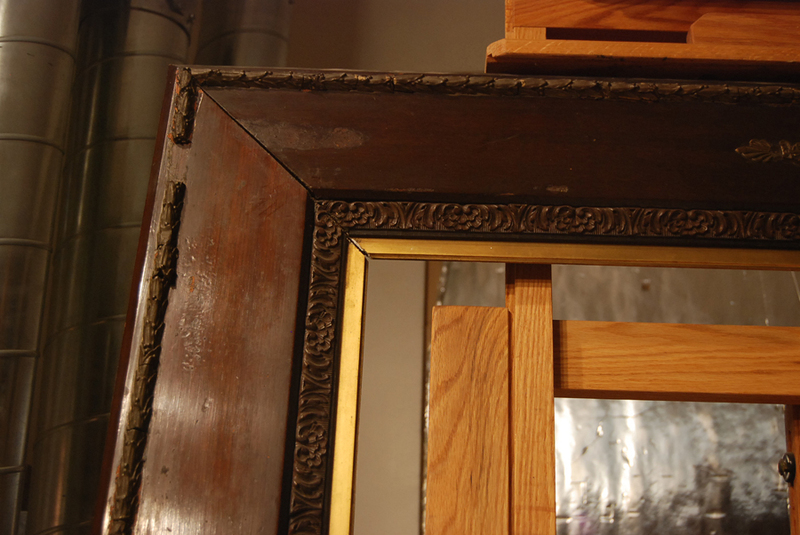 The finish on the flat areas of the frame was rebuilt with multiple layers of shellac applied with a French polish. All gold ornaments were inpainted using mica powders in varnish and nicks, scratches and gouges using conservation grade paints. A brush coating of shellac was applied over all ornaments to create the appearance of an aged finish on the frame. A final coat of microcrystalline paste wax was applied over the entire frame and then buffed. The painting was reinstalled in its’ frame using brass mending plates, braided picture wire, “D” ring hangers and Coroplast corrugated backing board.